A. Full-time in the Charleston SC area since 2016, I serve Charleston, Isle of Palms, Sullivan's Island, Folly Beach, Goose Creek, Summerville, Moncks Corner, and Mt. Pleasant areas of SC. Special exceptions can be made for other local travel - please call to discuss. I continue to travel to Northern VA seasonally for sessions and accept assignments in Fairfax City and Fairfax County, Arlington and Alexandria. To inquire about or be waitlisted for a Virginia session, please contact me. Q. What is included in the session fee? A. My one-hour session fee is quite affordable for custom photography and includes local travel to/from the appointment*, the hour of shooting (sometimes a little more) with your pet(s) and you, meticulous editing of your images to create a proof set (additional or extensive edits requested beyond routine may incur an additional charge), walking you through your selection process, and refining the images for your wall art, albums or prints/other products. Prints and products are not included with the session fee unless there is a special offer specifically stating otherwise. (A nominal travel charge may be applied for more than 40 round trip miles incurred in the Charleston area, or 25 miles round trip in the Northern VA area during seasonal appointments.) Also, certain Charleston area locations will incur a location premium charge for weekday morning sessions. Location options will be provided at the time you reserve your appointment. I have found that pets' attention spans don't last much longer than an hour - we will take the extra time if we need it, but it's usually not necessary. Shipping and handling, and state/local sales taxes are not included in special offers or session fees but will be charged separately as required. If there are park entrance fees or permits required, Clients will have the obligation to ensure these are paid for their session and the members of their party. I will, however, pay for my own park entrance and any associated parking fees I may incur. So basically, we are going Dutch! The session ensures your pet will be the center of attention! They will earn healthy, natural treats and likely exhibit some never-before-seen head-tilts when they hear some of my goofy sounds. They will also be showered with my affection, with your permission, of course. I have had people inquire as to whether they would receive all their proof images as part of their session fee. The answer to this will always be NO. First, I don't develop all of the images shot, only my favorites. Then I pare it down even further before finalizing the proof gallery. Digital collections are available for purchase, but, absent a special offer, prints or products are not included with the sitting fee unless they are specifically stated as such. A. Basically, you tell me a little about your expectation and your pet(s). We will discuss your vision and what you hope to achieve from the session. We can then determine a location and schedule an appointment. My preference is for secured (fenced) locations so the pets can feel free to express themselves unrestrained. However, if we are in a park, it will be "safety first" so I will ask that they remain leashed and I can then deal with any leash issue in editing. You will receive a Client Guide by email that may have helpful information for your session - please take a moment to read it. If you are bringing two or more pets, you may be asked to bring a friend or handler to help manage them during the session. I do accept credit cards and Paypal, for those who prefer to pay via this method. Personal checks and cash are fine too! The only amount due at the time of the session is the actual session fee or, if participating via a special offer or mini-session, whatever that promotional amount is. A small convenience fee is required for credit card and Paypal payments. When the sitting day arrives, I'll take a few minutes to get to know your pet so they are comfortable and enjoy the experience. If your pet is generally on the high-strung side, please take them for a brisk walk beforehand so they can be more relaxed during their session. It really is true that a human's energy and anxiety can affect a pet's mood (and the session). If a human is anxious or worried that their pet is not exhibiting model behavior in public, or they are too demanding of the animal (i.e., repeatedly yelling at him/her to sit or stay), the pet won't enjoy the session (neither will you) and this will be reflected in the photos. I have an infinite amount of patience when photographing pets so just relax and enjoy the experience with your companion. Policy change as of 9/13/18: Within two weeks (usually less) of your session, we can schedule an in-home review session (no additional charge). I can then bring sample products you can see/touch and we can go over the gallery together while looking at your space, etc. Bonus for the in-home review: clients receive a generous credit toward certain purchases. If you would rather decline the credit and NOT participate in an in-home review, a password protected, low-resolution gallery can be posted for your private viewing for a short period of time. It should be noted that I don't begin editing until a session is paid, so if you forget your checkbook, your proof set clock won't begin until payment is received. Q. Do you have suggestions for the session day? One of the BIGGEST things I have found is that the pets are generally fine - they smile, they play, they enjoy the adventure! But what I have also noticed is when people want to be photographed WITH their pets,the best images result when the humans are relaxed too. So don't try too hard. Just relax and go with it. If you are tense or stressed, it will show in the photos - I am not a magician. Bask in the simplicity of your pet having a blast and just enjoy the pleasure of their company! Q. Who owns the copyright of photos taken? On ownership of creative works, copyright law is pretty clear cut and waivers are a necessity in a creative field. A freelance artist who has created a work owns the copyright. Since these types of photos are typically for personal use, a freelancer (me) may offer a client a Rights Managed relationship specifying a particular use and/or time frame in exchange for the payment, but the originator (me) will retain the actual copyright. Q. Where might we have seen your work? A. In addition to panel displays at Dogma Bakery & Boutique in Arlington VA, Parkway Veterinary Clinic in Burke, VA, and now Woof Gang Bakery and Boutique and Ziggy's Dog Parlor in Mount Pleasant, SC, my work has been used in multiple print publications (see partial listing below), several rescue and other web sites, and I have had multiple features on The Daily Dog Tag. Other notable media use in 2013 included photos in the big screen premiere of the Stand Up for Pits video, as well as on The Pet Show with Dr. Katy. A 13-piece large print collection is also now on display at the Charleston Animal Society, as requested, for the renovation of their adoption space. My annual Santa photo fundraiser work was discussed (with photo features) on Lowcountry Live (ABC 4 News). 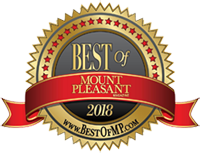 In December, 2017, the winners of the Best of Mount Pleasant were announced and I was so pleased to learn I was honored as Best Pet Photographer, 2018. I was also happy to find my work listed under "20 Local Photographers You Should Follow on Instagram" in May 2018 (CHSToday). And currently, several of my photos are in use for TV and other media promotions as part of a history-making statewide adoption campaign - PickMeSC. And, December, 2018 I just learned of my selection for this year's Best Pet Photographer under the 2019 Best of Mount Pleasant. In early 2013, my photo of "Roger & Storm" was selected as the cover for the 2013 Paws for Charity Book. This art book was on the Publisher's Best Seller list for quite some time! Collateral images are also in use by Embrace Pet Insurance and Anicira Veterinary Center, USA Dog Shop as well as other national brand commercial clients. Images have been selected for use in TV ad campaigns and CAS has several images in use for their vehicle wraps. Additional representative publishings include the following.